To Eat or Not to Eat? What is the Question. I thank all of you who have responded to my weekly posts and to my books by contacting me via our website email box: DrJosef@StrengthForLife.com. Your comments and questions are appreciated. Please continue to send them. I will do my best to read and respond to your provocative inquiries. 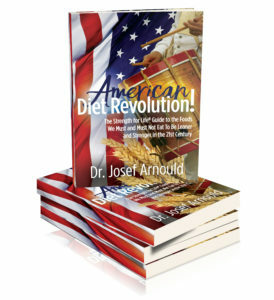 Many comments and questions come from people who refer to my latest book, American Diet Revolution! (ADR! ), which, coincidentally, will be released in print version on February 12. This date, not coincidentally, is the anniversary of the birth of Abraham Lincoln. Why do you include the history of dietary advice in the United States going all the way back to the 1950s? It’s almost seventy years later. Wouldn’t it be a lot simpler to just tell us what to eat and what not to eat now? The reason ADR! begins with a summary of dietary advice in the US since the 1950s is because most Americans today are confused by conflicting sources of dietary information. One “expert” says, “Eat whole healthy grains.” Another guru says, “Eliminate all grains from your diet.” Whom should you believe? In my opinion, to answer this question intelligently, you must gather enough information to be able to decide for yourself. Merely accepting what the smoothest talker says will not lead you closer to nutritional truth and better health. For 35 years, I have asked the patients and exercise trainees in our clinic to complete a diary form of every food, drink, supplement, and medication they consume over the course of one week. This provides me with a sharply focused snapshot of each individual’s dietary habits. In addition, studying so many food diaries of so many people for such a long time has given me a very clear overview of what most of us eat on a regular basis. From this perspective, I can state with great conviction that the vast majority of Americans today eat as if they were following the dietary advice of the 1960s, 70s, 80s and 90s. Only perhaps 15-20% of us eat as if we are following the dietary advice supported by honest nutritional research of the 21st Century. To put it another way, even today, most Americans still eat as if they were following the 1992 USDA Food Pyramid. Why do a majority of us continue to pledge allegiance to the dietary recommendations of a nutritional scheme that even the USDA no longer supports? Based upon what thousands of patients and trainees have told me, they trust the official medical and government advice they learned while they were growing up. In other words, they accepted what they were told then and they continue to believe it today. It has been well-documented by distinguished contemporary researchers that the dietary advice Americans were told to follow in the last half of the 20th Century was not based upon honest and/or reliable nutritional research methods. Rather, to a great extent, much of that dietary advice came from “researchers” whose work was paid for by agricultural cartels, special industrial interest groups, and others who were motivated above all else by increasing sales of the most profitable commodities and services they could foist upon an unsuspecting and unquestioning public, that is, upon us. Only when we understand and admit how badly we were deceived by the dietary advice of the 20th Century, will a majority of us become healthy, active, committed, questioning, nutritional revolutionaries of the 21st Century. This is my hypothesis and why American Diet Revolution! begins with a brief history of dietary advice and nutritional research in the US from the 1950s to present. Once we have disabused ourselves of the dietary propaganda of the past century, and once we have armed ourselves with what honest nutritional research of this century tells us, then we become capable of deciding for ourselves what foods to eat and what foods not to eat. Thus, understanding our dietary past enables us to achieve the freedom of good health for the future.